One of my most favorite things to do after dropping Maryam off to the nursery is to while away the time at the bookshop. I usually scoop half a dozen of my favorite food magazines into my arms, trying my best not to draw attention to myself. I then spend the next few hours snuggled in a cozy corner, browsing each one page by page, cover to cover. As I turn each glossy page, I'm transported to another world, enamored by the beautiful pictures, intrigued by the unusual recipes. I take it all in and when I leave, my mind is buzzing with new ideas, unfamiliar recipes and the excitement to rush home and try them out. Like this one. I recently read a recipe for a no bake cookie with various nuts and wafers, all amalgamated together with a mixture of condensed milk and melted chocolate. Although I don't remember the exact magazine nor the exact recipe or ingredients, I knew I wanted to try something similar. Now, I have a special relationship with nuts so I knew that this bark had to be about the nuts. 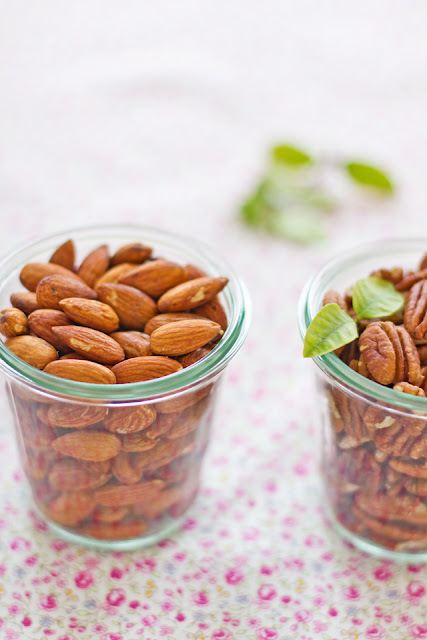 I love them all- pistachios, almonds, pecans, hazel nuts. Green ones, crunchy ones, toasted ones, sweet ones. There isn't a nut I don't love and I like to appreciate them in all their forms. Maryam too. We don't generally get very far with cooking with them as she is constantly popping them into her mouth. Then another. And another. And before we know it- 'Mummy, it's finished.' It has ceased to surprise me when I find a stray one in her toy box, behind the sofa, on the carpet or in her doll's pushchair. Nuts and raisins too. I decided to make this as a surprise addition to her lunchbox. But they didn't make it that far. We took them along for the road on our way to Ras al Khaimah last weekend. It's always been an unsaid tradition to bring a snack for the road on any car journeys for weekends away or picnics. 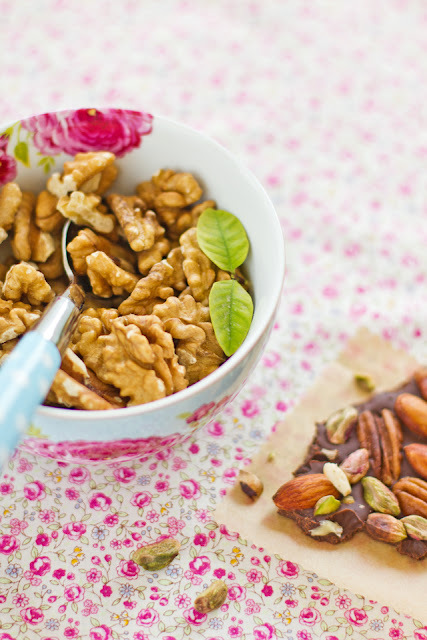 The recipe is fairly versatile- just use any nuts you have on hand. I added some raisins too as Maryam is a fan. I didn't really have a plan with this recipe, use whatever you have on hand. Hopefully this week I will manage to edit the rest of the pictures from our trip and share them with you along with a birthday cake. Line a baking tray with baking paper. Roughly chop the chocolate and melt in a double boiler or in the microwave. Stir to combine and spread the melted chocolate over the baking paper to your desired thickness. Sprinkle the nuts over the melted chocolate (I chopped the slightly larger ones like cashew nuts and walnuts in half before doing so). Put in the fridge to set. Once set, break or cut into pieces. Can be stored in a refrigerator for at least a week, if not more. Oh so easy? Those look fabulous Sukaina! Beautiful photos. I love the flower cloth! Yummie barks! Love your easy recipes and inspiring pics. Also dried berries or raisins goes well with nuts and choc. Wow! It's so simple and delicious. I'll surely give it a try. Absolutely delightful..easy to make and good for a quick healthy snack! Beautiful luminosity in your photos... love that you made this bark with dark chocolate. Oh..it was your birthday? Belated wishes dear....I missed it..hope you had fun in that beautiful getaway. This recipe is so easy & quick. reminds me of sort of homemade cadbury's fruit & nut. I m sure Maryam would have loved it. I love this! All of my favorites together in one. These barks are pure indulgence for me .. i need nothing more than those to keep me excited! Belated happy b'day, beautiful! ♥ Hope it was first-class, just like you. I totally relate to your experience of flipping through glossy magazines and suddenly feeling a burst of energy to try ALL those delicious recipes, ah. Totally love the simplicity of this recipe. A great idea to fill up the cookie tin. And such colorful images, love them all. Wish I still lived in the UAE instead of Doha. Would have loved getting to know you better. Do gimme a shout if you ever plan to visit this side. No wonder Maryam likes these. 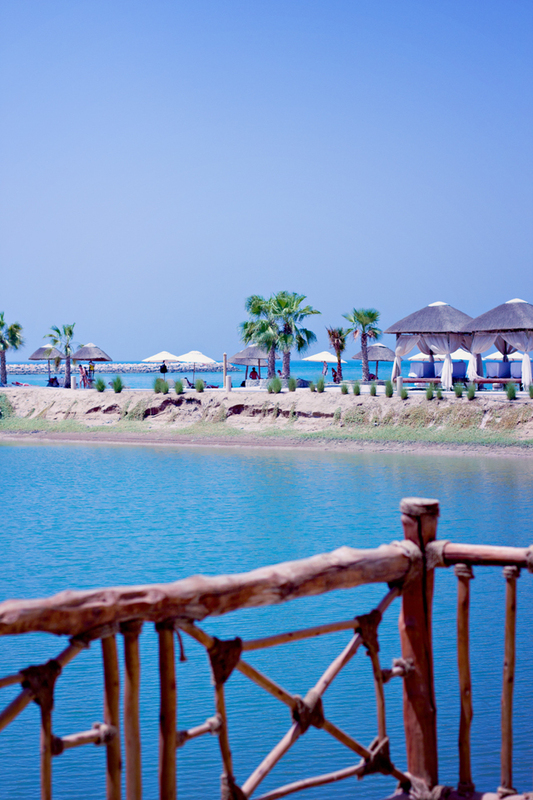 Look forward to seeing the rest of your RAK pics. Beautiful I can see myself enjoying this yummy bark while reading. This looks like a simple and rewarding treat! Sure beats Jelly Bellys for the road. Beautiful presentation as always! I love easy and versatile recipes like this!! I am planning on making a big batch and giving it away as gifts too. Thanks for the idea! 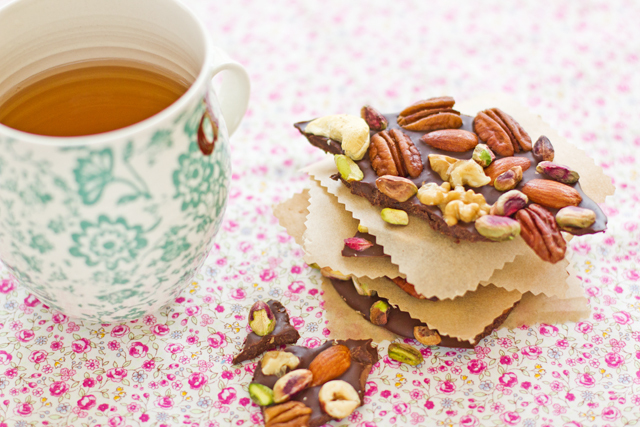 Love chocolate bark! Good to have a recipe in my backpocket now...these would make for the perfect afternoon snack. Love it! The colors and texturesw are so pretty, too. 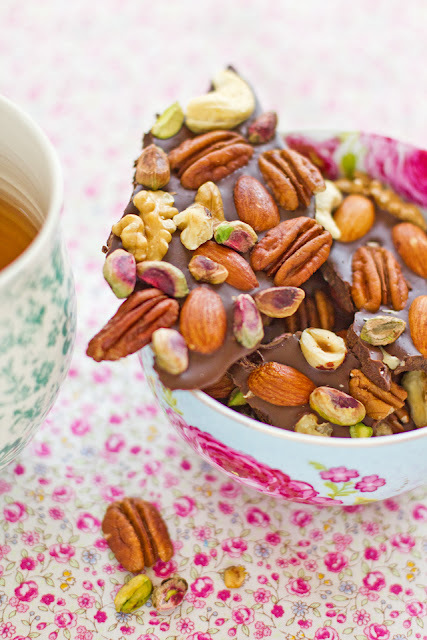 Chocolate + nuts = heaven to me. Belated Birthday wishes to you. I am sure you had a fun getaway with your family. Oh my gosh! This is so much better than Fruit and Nut (well, they are both awesome) but this would be fun for the kids to make too and it's customisable - love love love! These barks look absolutely amazing!! Thanks for all the lovely comments. This is really the easiest snack/ dessert I have made. Your bark looks great! 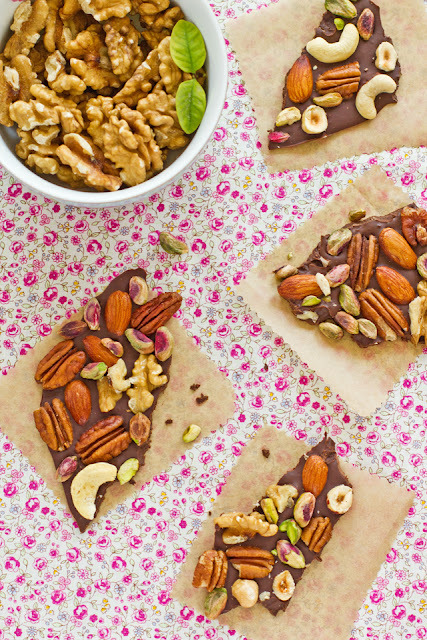 Making chocolate bark with nuts and fruits is one of my favorite desserts. My favorite combination is walnuts, dark chocolate, and tart cherries but white chocolate, pistachios, and cranberries comes a close second! I love eating bark but never thought to make it. Easy peasy and oh so delicious! I'm going to do it! this looks excellent, hard for a chocolate and nut lover to wait! Such a simple delight. My daughter makes the barks when I do not have any dessert at home:) but it is usually walnut or slivered almonds. I should try a mix, it looks so very pretty. 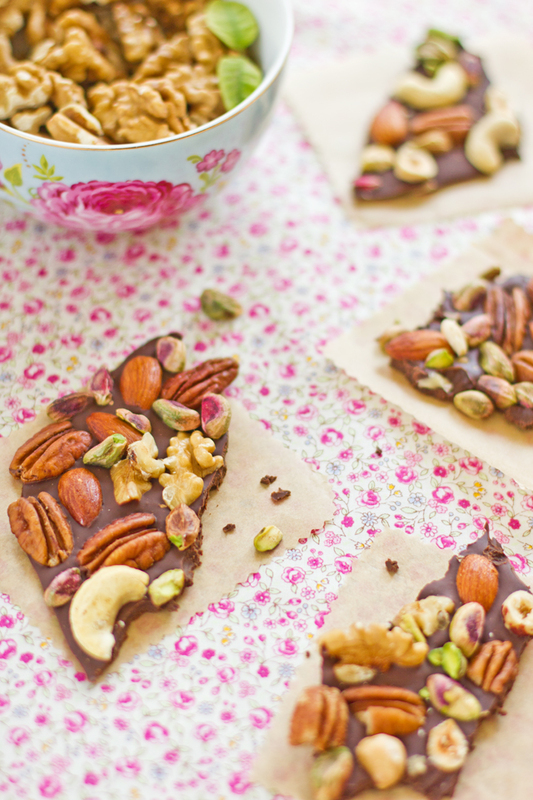 Beautiful photos and such a lovely recipe for bark! Thanks so much for linking them up in the Holiday Recipe Exchange! If you have teenagers, you can create moving day an pleasant venture. Let your children help you with packing the factors before the moving day. They can brand the box, and organize products that you are not sending with home moving organizations Expert5th.